SINGAPORE - Singapore is generally doing well in investing in human capital and is well-positioned to deal with the changing nature of work, said experts and the World Bank. The remarks were made at a discussion at the Lee Kuan Yew School of Public Policy on Thursday (Dec 13), where experts and policymakers spoke about the highlights of the 2019 World Development Report on the Changing Nature of Work released by the World Bank. In October, the World Bank released an index that ranked Singapore first out of 157 countries in terms of developing human capital. The index showed that children born today in Singapore will fulfil 88 per cent of their potential to be productive when they grow up, given that they get a full education and enjoy good health. It used indicators such as the probability of survival to age five, a child's expected years of schooling, test scores, adult survival rate, and the stunting rate among children. Singapore was ranked ahead of South Korea, Japan, Hong Kong and Finland. In the latest report out on Thursday, the World Bank noted that although there were concerns that technology would replace jobs, new platforms will create employment opportunities in fresh areas. "Robot density per worker in 2018 is the highest in Germany, Korea and Singapore. Yet in all of these countries, despite the high prevalence of robots, the employment rate remains high," the report said. Mr Michal Rutkowski, the World Bank's senior director for social protection and jobs, said: "Innovation brings new employment in new sectors and innovation will win over automation. These are not the same jobs, but jobs that have higher productivity." He added that new platforms, such as Grab, also expand job opportunities. Singapore is able to take on these changes, he said. 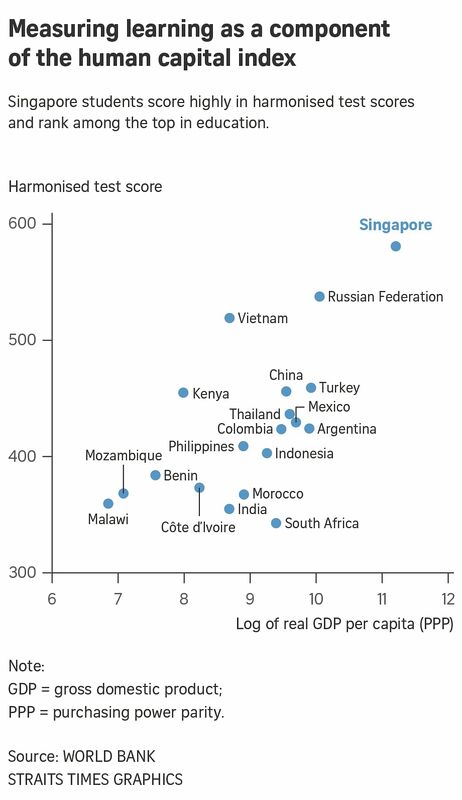 In terms of education, Singapore ranks highly. According to the World Bank website, its students scored 581 on a scale where 625 represents advanced attainment and 300 represents the minimum. A score of about 400 corresponds to a benchmark of minimum proficiency set by the Programme for International Student Assessment (Pisa), the largest international testing programme. The report explained: "Less than half of students in developing countries meet this standard, compared with 86 per cent in advanced economies. In Singapore, 98 per cent of students reach the international benchmark for basic proficiency in secondary school. Essentially, then, all of Singapore's secondary school students are prepared for a post-secondary education and the world of work." Said Professor of Economics and associate dean Hoon Hian Teck at the Singapore Management University: "Singapore is now at a stage where we are at the end of the previous phase of growth (that borrows technology from others). We now need to generate indigenous innovation, by creating our own ideas although we still borrow some technology from abroad. We want to support this next phase of growth and facilitate the entry of new firms."